oday phonostages purposed only for MM (Moving Magnet), high output MC (Moving Coil High Output), and MI (Moving Iron) cartridges (made mostly by Grado) are true rarity. To be honest, I do not know why. There are only two types of phonostages without MC section – very cheap ones, for people who are only entering the world of vinyl, and very expensive ones for sophisticated audiophiles. The former count every penny they need to spend, so simpler, ergo less expensive device based (usually) on a single chip is preferred. The latter are quite different – these are guys who prefer to use step up transformers for their MC carts, instead of active circuits. I think most such users can be found in Japan, where many advanced audiophiles use a step-up transformer for particular cartridge, and they connect it to their active MM phonostages. And I guess that's the case here. As you can read below, Mr Alexander Remmer, the owner and designer of Czech company Remton, wanted to build the best MM phonostage he could, assuming it would work perfectly with MM, MC HO or MI cartridges, but that would also give its user a possibility to use it with step-up transformer for MC carts. So he built the LCR model with custom made Sowter coils, and SCR and Itel capacitors. It is a tube phonostage with ECC81 double triodes in the input stage, one per channel, and one E88CC per channel in the output. And what happened? It turned out that most customers who bought a tube phonostage wanted to use it with... MC carts. Mr Alexander turned the MM version into MC one adding in the output..., yes, you guessed it – step=up transformers. And his portfolio gained a new model called MkII, that allows user to adjust input impedance and works with MC cartridges. Mr Alexander delivered for test the basic (MkI) version of this phonostage, the one for MM carts. Why? Because, according to him, it is a better solution for any vinyl fan: „I definitely prefer using MC carts with external step-up. 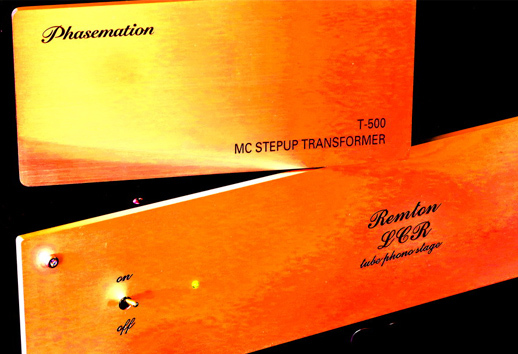 In our opinion those who can afford to buy LCR, can also afford to purchase a step-up…” As he says, the Sowter step-up transformers he uses for MkII offer a very good performance but there are many others, even better ones, available on the market. So the basic, MM version, is, according to him, the more sophisticated one. At the first sight the device looks really good, solid, high quality sockets also create a very positive impression. Even the writings on the front wall are nicely done. Is it a pure coincident that company's logo is somehow similar to the one of Japanese manufacturer Phasemation? I don't think so – I believe it is rather sort of a tribute to one of the best specialist. And it is also not a coincident that this company offers two high quality step-up transformers: T-300 and T-500. 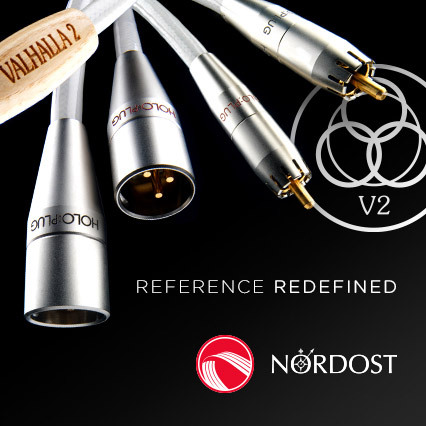 The company is young, and was founded is in the Prague, Czech Republic, with the idea to produce high-quality tube phonostages at an affordable price. The first exhibition we participated in was High End Praha 2013, where we presented Remton 383 and Remton 8382 models (see HERE and HERE). 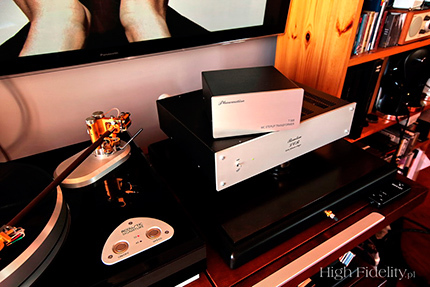 Remton LCR was first shown at the exhibition High End Munich 2014. 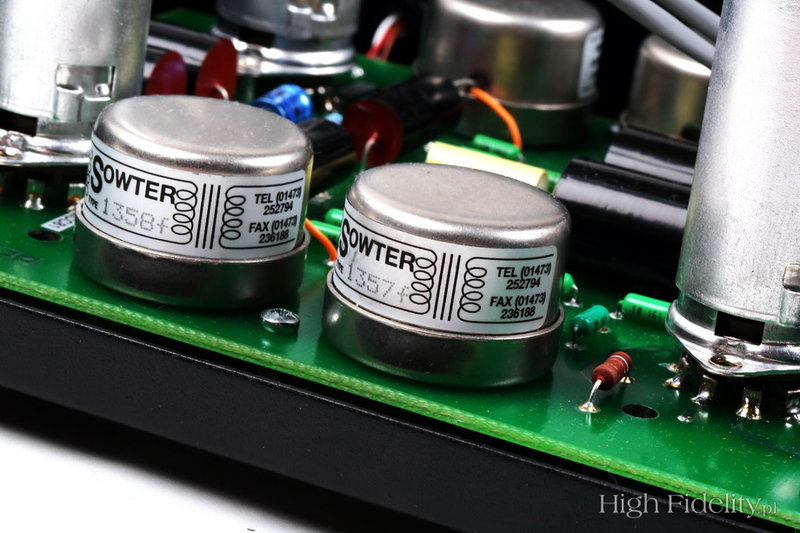 LCR phonostage built on the Inductive RIAA emphasis Network, LCR filters using custom made coils from Sowter, SCR and Icel capacitors, and precision non-inductive resistors. 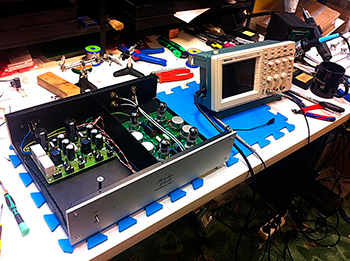 Before assembling all components have been handpicked basing on measured parameters. All models were made with the MM input, because we consider the MC cartridges, for high quality, must be used with appropriate to it MC step-up transformer. But our customers would like input for MC, so it was decided to make Remton 383 MK2 and Remton LCR MK2 with Sowter MC step-up transformer. The Remton LCR is optimized to work together with step-up transformer. Obviously it could be used as a classic MM phonostage but considering its price one would have to use most expensive unit of this type, like, for example, Grado's MI (Moving Iron) carts. For this test I used Phasemation T-500 step-up. First, to determine its influence on sound, I used it with MM section of my RCM Audio Sensor Prelude IC, and than with Remton LCR. Arp-Life, Z bezpieczną szybkością, Polskie Radio/GAD Records GAD LP 004, „Limited Edition of 100 grey wax” 180 g LP (1978/2014). Kraftwerk, Computerwelt, EMI Electrola GmbH 1C 064-46 311, LP (1981). Maria Callas, Maria Callas Remastered, Warner Classic 624295, 180 g LP (2014). Miles Davis & Milt Jackson, Miles Davis All Star Sextet/Quintet, Prestige/Victor Musical Industries SMJ-6530, LP (1956/1976). Yasunao Tone + Talibam! + Sam Kulik, Double Automatism, Karlrecords, 180 g LP + Test Pressing (II) (2015). Sound signature of phonostages with a passive element (transformer) differs from ones with active circuits. I guess it is obvious otherwise there wouldn't be two groups of users with clear preferences of one method over the other. Remton is one of the best examples of how the sound of the former is tuned, because on one hand it has its own sonic signature easily recognizable, on the other it provided some elements of the sound that I remembered from my review of Manley Steelhead v2, that are common for most phonostages with transformers in the input stage. Not to complicate this review I will describe the overall sound signature, only in particular cases pointing out whether particular feature comes from phonostage itself, or if it is characteristic for this type of device. The reviewed system delivered rich, organic sound. That's what I noticed when listening to the first record, but it stayed in the back of my head also after many days of listening. Sound, timbre seems so rich as, in photography, after editing raw picture and adding some color and enhancing contrast. There is no exaggeration here – it is a small adjustment to make sound bit more lively than in reality and thus – more attractive to listen to. Many manufacturers do the same thing using different means. But the Czech phonostage does it in a particularly charming way. There is no significant coloration of lower midrange, no bass enhancement, and yet sound seems “big” and palpable. The latter feature is particularly impressive as it is something one expects from tube device and rarely receives. Remton brings front plane of the soundstage closer to the listener, thus increasing depth of the stage, rendering wonderfully three-dimensional instrument. The space is is not particularly precisely described, not is it particularly selective – that is something to be expected from a step-up transformer (any). And yet the soundstage is huge, show sort of natural structure, and the sound seems big and warm. It is particularly impressive when mono records are played, as such recordings require a system that is able to deliver large phantom images. 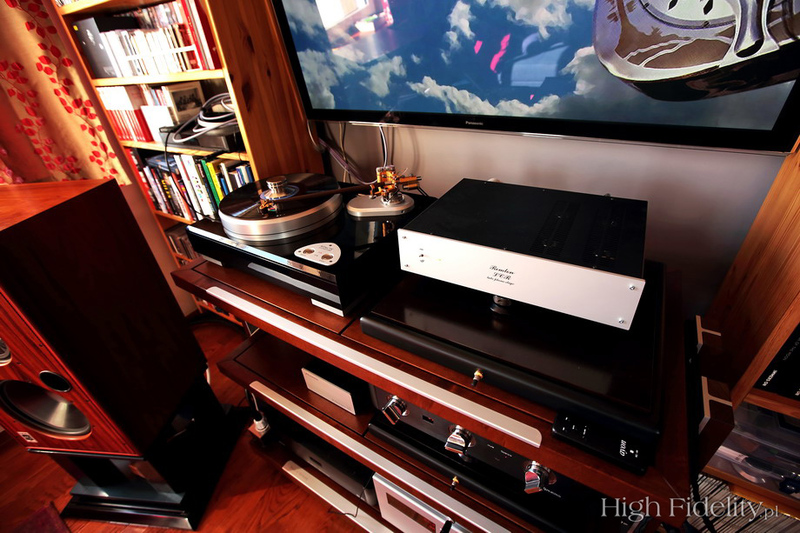 The phonostage under review presented Miles Davis and his quintet and sextet exactly in such a way – placed in huge space, delivering rich, palpable sound. I am an owner of a Japanese, 1976 edition of the Miles Davis All Star Sextet/Quintet record from 1956. Even though it was released on a regular vinyl (at the time „180 g Heavy Weight” was still only a distant future), not on „deep groove” (as the original issue), and the sound is amazingly coherent. It sounds almost warm, except it really isn't. Remton conveyed this music in a warm, spacial way, unlike many other phonostages that deliver this music in some formless way. Sound wasn't as fast and not so dynamic as presented by my RCM Audio Sensor Prelude IC, but it was simply different. It was smoother, warmer, more palpable, rendered closer to the listener, more organic. The last feature, I believe, is why many people decide to use step-up transformers. These make sound more vibrant but without adding any brightness to it. There is incredible intensity of midrange and treble combined with softening of the attack. That's what make the sound of this system so attractive, so lively, so intense. And yet it is quite... unobtrusive, non-aggressive. What's more – it seems like this system with phonostage and step-up is able to play any records in such an attractive way, not just some classics that sound well on 1000 PLN ProJect and 250.000 PLN TechDAS, like Dire Straits' Brothers in Arms or Diana Krall's All For You (although I started my listening sessions with such classics and only later moved to other records). I listened to the Mobile Fidelity 2 x 45 rpm 180g vinyl recent release of Dire Straits. Breaking its own principles MoFi released this recording in their „Original Master Recording” series, that is used exclusively for re-issues made of original analogue master-tapes. As all fans know, this Dire Straits recording was done in digital domain and mixed using analogue console to digital tape (DASH or DAT – not really clear on that). Whatever the source of this material, the new re-issue sounds fantastic, so I don't care what they used to prepare it. The system with Czech phonostage delivered smooth, rich sound, slightly underlining Knopfler's voice, and in Money For Nothing also Sting's. Leading guitar was prominent, rich, although not as three-dimensional, so distinct as delivered by RCM Audio. The lesser selectivity and dynamics are a price to pay for more organic, more palpable presentation (also warmer, although this feature doesn't influence perception of music that much). This phonostage is tuned in such a way that a combination of such system – transformer with tubes – would offer the best possible performance. I had no chance to compare them head to head but I think I remembered pretty well what were the differences between above mentioned Manley Steelhead and my own RCM Audio Sensor Prelude IC.